Home > Read the papers! > Missing out on final tournaments since 1988. England’s U21 should learn from the Romanian experts! Missing out on final tournaments since 1988. England’s U21 should learn from the Romanian experts! It’s no surprise to see Romania’s U21 challenging for a spot at Euro 2011, 12 years after its last appearance at a final tournament. The first league has changed a lot in the meantime, with several clubs outside the capital winning trophies and getting European exposure, and what a lot of people feared – mediocre foreign players blocking the development of young Romanian players – didn’t affect the promotion of the hottest prospects, now spread throughout the country. Clubs like Otelul Galati and Universitatea Craiova offer the best example and have determined the Bucharest sides to change their strategy – with Steaua investing heavily in youngsters like Radut or Gardos and offering them the much needed playing time for a continuous development. The number of promising players used regularly in Liga I has increased so much that even a lazy and modest coach like Emil Sandoi managed to field a strong team, one that won a group that also featured the mighty Russia. Unfortunately, this wasn’t enough to earn a presence at a final tournament and the odds offered Romania one of the toughest adversaries available. England enters the tie as a big favorite – suprise, surprise! – and the only thing that changed is that Romania has more than a couple of players who could match their opponents. They’re spread all over the pitch and a good coach would have faced this two games with a solid team, with a clear playing strategy. Not hoping for several outstading individual performances, instead waiting for one good game from a good looking team. Still, there’s some hope. 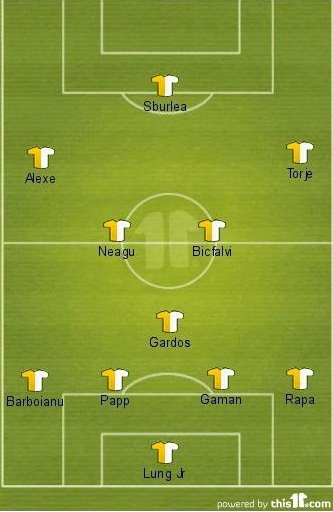 Romania has a good pair of centre backs in Papp (FC Vaslui) and Gaman (Universitatea Craiova), but I wonder if Steaua’s Gardos will end the match where he’ll probably start it, and that is in front of the back four, not at the heart of a back five. Gardos could add the missing strength in a midfield that relies on his team-mate, Eric Bicfalvi, and the impressive Ionut Neagu, from Otelul Galati, but we’d have three defensive minded central midfielders, who all are more attracted by Romania’s penalty box, not by the opposition’s. This leaves Sandoi with very little offensive options and just one gameplan: counterattacking. Agreed, Dinamo’s Torje and Alexe should prove a handful for their adversaries, while Rapid’s Sburlea is an athletic, mobile and sometimes dangerous from distance forward, maybe not suited for the lone striker’s role, but should enjoy the chance to trick a defensive line pushed high up the pitch. The front men have the skills to hurt England, but they’ll also need a ball to do it, so the big question is if the seven defensive players will block their skilful and stronger opponents and have enough composure to try and play some football, not just attempt to kill it, for 90 minutes. My only hope is that Romania will not get murdered in Norwich and Sandoi will be forced to let the young guns take their shots at the one in a lifetime opportunity, in the second leg. I’m quite content with our U-21 team, losing away 2-1 against a team like England isn’t bad at all, even though we were initially up 1-0. Romania’s senior team is in an awful position, however. I can’t believe Lucescu Jr. is still the manager… anyway the game ended 2-0 for France, two late goals from the youngster Loic Remy and Yoann Gourcuff, both players having been substituted late in the game. Samir Nasri was especially amazing this game, even if he was taken out and replaced by Gourcuff near the end. The best players on our team were Pantilimon (really really great keeping for a youngster like him! made lots of incredible saves), Deac (great winger, he should be a national team regular from now on imo), Chivu (saved us from France scoring a few times, notably the one where he just managed to kick it over the net at the last second) and even Florescu (had a good shot at the start of the second half and was okay throughout). Marica was also decent, here and there. I think he was the one who the post and thought it was a goal? I don’t exactly remember. But overally, we played awful. I’m tired of losing all the time and seeing their crappy (beyond crappy, actually) passing and other dreadful displays. Something must change.